State Attorney General Eric Schneiderman has won a nearly $800,000 judgment against a Papa John’s pizzeria franchisee found to have shorted his employees on pay — including not paying them for overtime. Emmanuel Onuaguluchi, who owns six Papa John’s eateries in Brooklyn and Queens, rounded down to the nearest whole hour each employee’s workweek, according to court orders obtained by the AG. Onuaguluchi not only ripped off hundreds of employees over six years in this manner, he tried to sell the stores to get out from under the court orders, the AG said. Schneiderman’s judgment, expected to be announced on Monday, bars the businessman from selling the six stores unless the cash is deposited into an escrow account of the AG. In addition to going after the franchisee, Scheiderman is weighing legal action against parent company Papa John’s, alleging that officials were aware of the franchisee’s actions. “We might expect something against the franchisor soon,” a source familiar with the situation said. The plan is to tie Onuaguluchi’s violations to John Schnatter, the company’s telegenic founder and chief executive, who is often seen on TV alongside NFL great Peyton Manning pitching pizzas. Onuaguluchi’s company, Emstar Pizza, like all franchisees, sends employee shift records automatically to corporate headquarters from point-of-sale registers, sources said. Placing the sins of the franchisee at the feet of the parent company is a new and controversial law enforcement tactic. The National Labor Relations Board in December, in a controversial and precedent-setting ruling, held McDonald’s Corp. responsible for the alleged discriminatory acts of a Virginia franchisee. Citing the NLRB ruling, 10 former employees this month sued McDonald’s. That ruling may pave the way for Schneiderman. Steinberg believes if franchisors lose the financial benefit of selling franchises, they may just keep more restaurants for themselves. Meanwhile, Onuaguluchi’s six Papa John’s — four in Queens and two in Brooklyn — continue Schneiderman’s push for fair pay for fast-food workers. 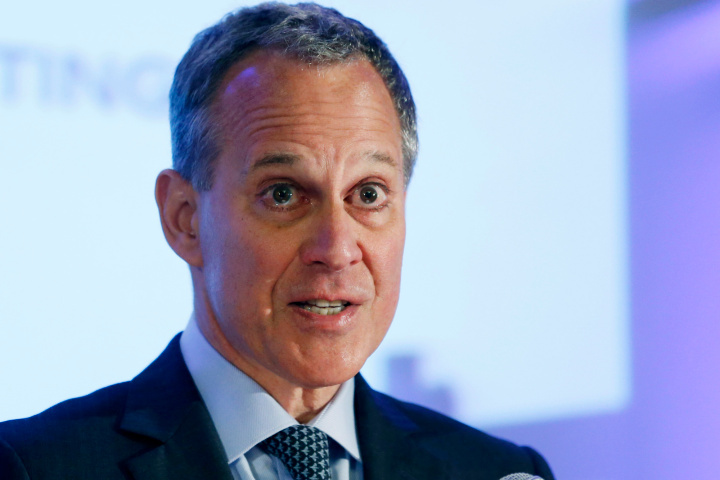 “This judgment sends a clear message that like every other business in New York, fast-food employers must follow the law,” Schneiderman said in a statement. The AG also has sued and won judgments against franchisees of McDonald’s and Domino’s. He claims his wife, Uchema, owns the restaurants and she signed the consent decree. The former resident of Rosedale, a Queens neighborhood, who is now separated from his wife, said he is now squatting and doesn’t have a permanent home. “As a company, Papa John’s International believes that all team members should be fairly compensated with market competitive rates and in accordance with the law. Our franchisees are empowered to operate independently. They make their own decisions on all business matters including the hiring, firing, and compensation of their employees. Papa John’s International has already terminated this franchisee relationship due to violations of our agreement. We do not operate any company-owned restaurants in the state of New York,” a Papa John’s spokesman said.